6” X 6” repeating pattern. Pricing is viewable by clicking the color option button below. 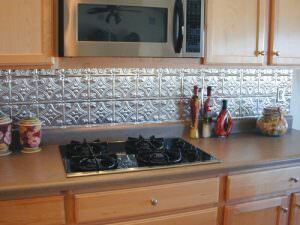 Looking to compliment stainless steel… Want to retain the “tin look” without painting… Order Clear Coat! 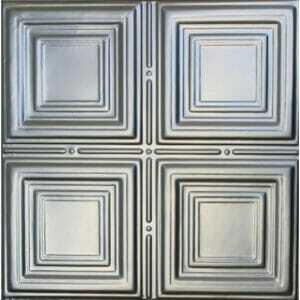 SKU: SKU001144 Categories: METAL BACK SPLASH & CORNICE MOLDINGS, METAL BACK SPLASH 18x24. 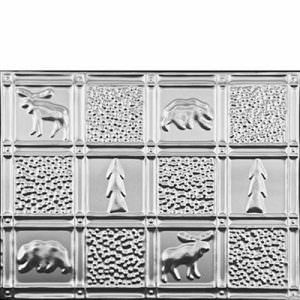 Nostalgia is created with the warmth and charm of the turn of the century offices, stores & businesses with use of metal ceiling tiles panels. 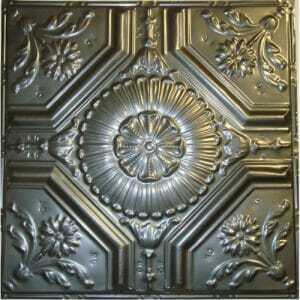 Tin Ceilings became popular during the late 1800’s as a low cost decorative substitute to expensive, artistic plaster. The Industrial Revolution and its automation meant that ornamental plastering and intricate stucco effects could be faithfully reproduced in metal. Metal provided the same beauty as plaster in a maintenance free format, Metal also had the benefit of fire safeness and economical installation making it a superior option. 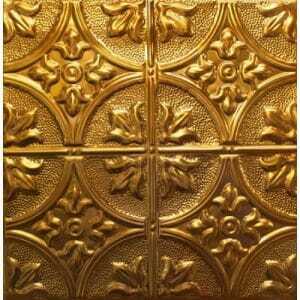 Tin or Metal Ceilings in the early days were primarily used in commercial buildings. Their attractiveness and low cost quickly spread to residential and office use. 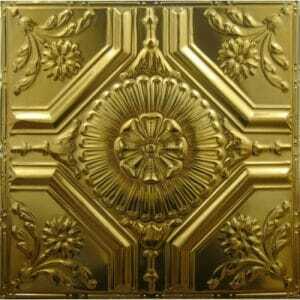 The same superior characteristics yesteryears tin ceiling exist today. Several new advantages have been added with Aluminum which was not used extensively until after the Industrial Revolution, is now a preferred metal because of its superior performance. 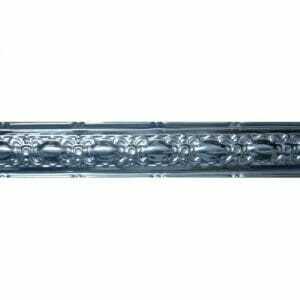 Aluminum is lighter in weight than tin plated steel making it easier to ship and install. 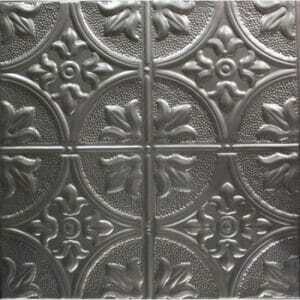 Aluminum is rustproof making it perfect for high humidity areas such as bathrooms, kitchens and humid costal climates. 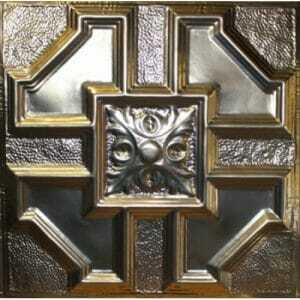 Products are also available in tin plated metals, much like turn of the century originals, and solid copper. Solid Copper left untreated over time will take on the rich patina copper from yesteryear. The aging process of copper can be hastened or stopped by applying a chemical solution. The Ceiling is actually overlooked often times but should be the most important and beautiful feature of any home or building. 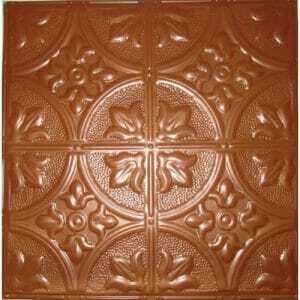 Ceiling Tiles By Us offers provides a wide selection of Ceiling Tile Products making your design possibilities endless. Actually limited only by your imagination. We feel we would be remised if we did not address the popular use of the word Tin Ceilings is a misnomer as Tin Ceiling Tiles, meaning 100% tin, most likely do not exist as careful research will more likely than not reveal the Tin Ceiling Tiles are partially tin. In reality the use of the words Tin Ceilings means in all probability the Ceiling Tile is Stamped Steel that is dipped in or plated with Tin as a covering. 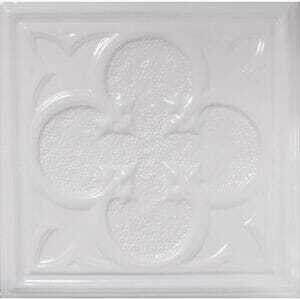 The reason for this is the metal tin is a soft silvery white metal that is very light and easy to melt. Being so soft, tin is rarely used as a pure metal; instead tin is usually combined with other metals in order to make alloys all that possess tin’s numerous beneficial properties. 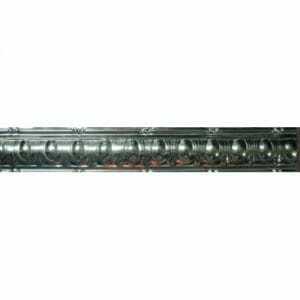 These include a low toxicity level and a high resistance to corrosion. Many everyday items that we associate with tin such as “tin cans” and “tinfoil”, are actually misnomers. Tin cans are in fact made from a compound referred to as tinplate, which is steel sheet metal that has been coated with a thin layer of tin. 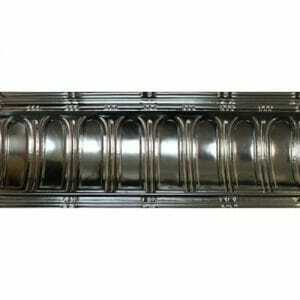 Tinplate efficiently combines the strength of steel with tin’s luster, corrosion resistance and low toxicity. 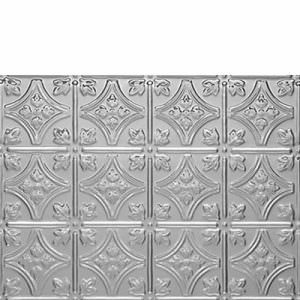 Most Tin Ceiling Tiles are tin-plated meaning they are made from sheet metal, thin coated with tin and in all likely hood will require painting. 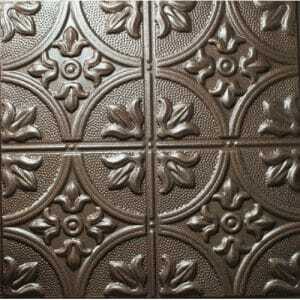 Another type of Metal Ceiling Tiles are those made from Unfinished Aluminum. 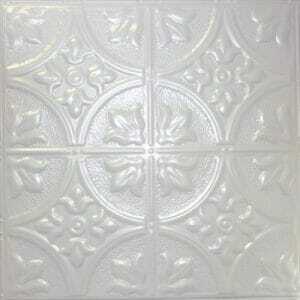 Ceiling Tiles made of Aluminum (unlike raw tin-plated steel ceiling tiles) will not rust. Steel will rust even if coated with tin plating whereas Aluminum will never rust. 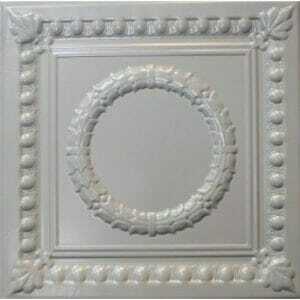 As with any unfinished Metal Ceiling Tiles they require painting. There are many Metallic Paints on the market and to purchase these beautiful Metallic Paints in for example Copper or Silver is very expensive and cost around $150.00 per gallon of paint. 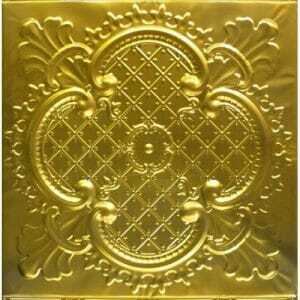 At Ceiling Tiles By Us we carry a wide range Ceiling Tiles made of Solid Copper, Aluminum, Tin Plated Steel & Plastic. 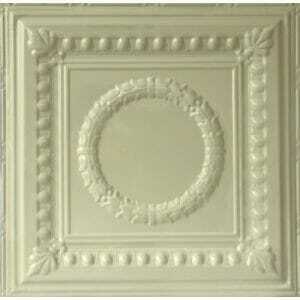 All vary in price & all can create a Beautiful Ceiling Panel or Wall Panel. All Ceiling Tile Panels and Wall Panels are manufactured using a proprietary process, each individual piece is inspected in order to insure high definition of detail to the pattern. Installation of our Aluminum & Solid Copper Metal Ceiling Tiles are designed for two types of Installation: nail-up to a wood substrate and lay-in to any standard suspension ceiling grid. The preferred wood substrate for nail-up application is minimum 3/8” plywood. The Ceiling Tile Panels will drop into any standard commercial 15/16” or 9/16” T-Bar Suspension Grid, consisting of a prepunched roll-formed steel exposed flange surface. Main runners and cross runners shall be installed to form 2 foot x 2 foot square openings. The Standard Grid Suspended Ceiling System shall be hung flat and level, suspended by 12-gauge pre-straight steel wire @ 4’ O.C. With Solid Copper Ceiling Tile Panels it is recommended that installers wear cotton gloves to prevent depositing oils on the panels during installation. 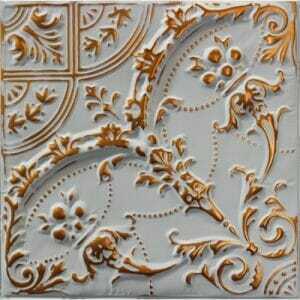 Ceiling Tile Panel Specifications are for Copper Ceiling Tile Panels are available as a nominal nail up size of 24-3/8” x 24-3/8” x 0.116” thickness and weighing 3.95 pounds per panel or as a nominal lay in size 23-7/8” x 23-7/8” x 0.016 weighing 3.01 pounds per panel. 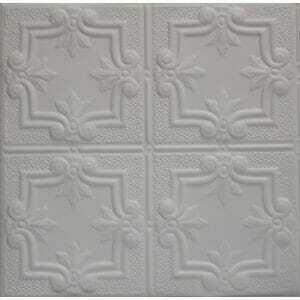 Ceiling Tile Panel Specification for aluminum Ceiling Tile Panels are available as a nominal nail-up size 24-3/8” x 24-3/8” x 0,016” thick weighing 0.95 pounds or as a nominal lay in size 23-7/8” x 23-7/8” x 0.016 thick and weighing 0.91 pounds per Ceiling Tile Panel. Colors are shown for reference only, and may vary due to printing and dye lot subtleties as well as Lighting when pictures are taken, Camera Variations as well as Internet affect in varying to some extent that the actual product may be at some minimal degree in color variations. Premium and Artisan finishes provide a beautiful custom look; however, the color may vary in appearance based on your selected pattern and may differ from panel to panel. 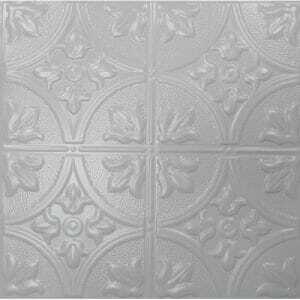 Mill finish tin ceiling tiles from Ceiling Tiles By Us Inc provides a raw metal finish for that tin ceiling artist in you! Use your Mill tin ceiling panels in an room of the house without worry of heat or humidity, as raw aluminum tin ceiling panels (unlike raw tin-plated steel products)will not rust. Mill tin ceiling panels from Ceiling Tiles By Us Inc come with standard, straight from the tin ceiling manufacture feel, and must be painted with any direct to metal paint. Mill tin ceiling tiles will oxidize after time, and care should be taken to avoid this if the oxidized look is not what you are going after. To view all amazing finishes.